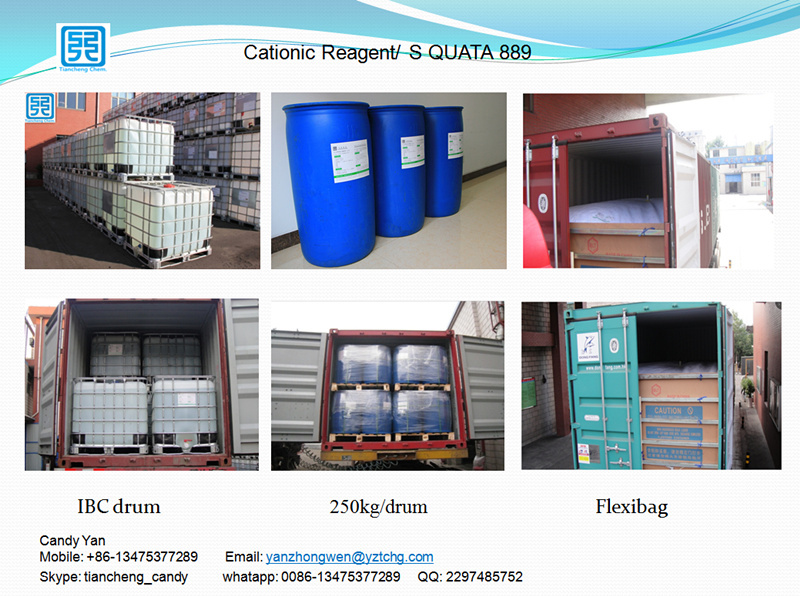 S-QUATA 889 has many names such as quat 188, CHPTAC, PTAC, CTA, Cationic Reagent, etc, used for cationic starch, cationic guar gum, cationic cellulose, cationizing reagent. 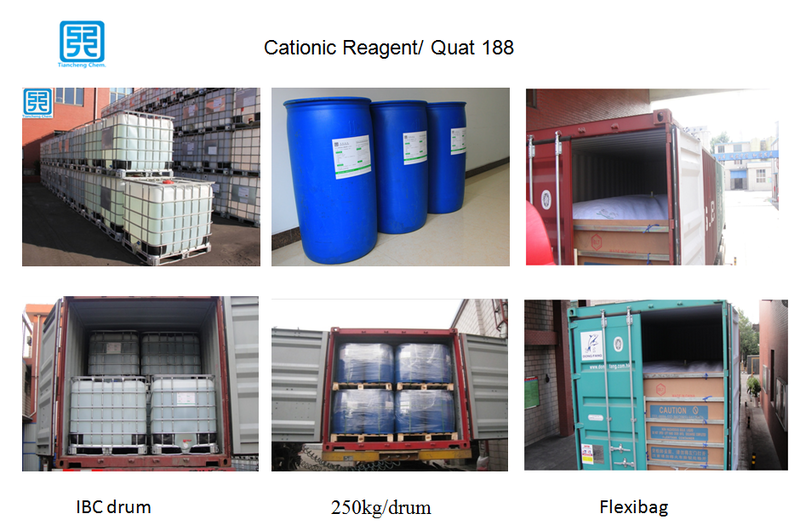 Tiancheng is one of the world`s largest manufacturers of Alkyl Ketene Dimer ( AKD Wax ) with 20 years experiences and the largest and best manufacturer of cationic reagent (3-Chloro-2-Hydroxypropyltrimethyl Ammonium Chloride/quat 188/CHPTAC), raw material for producing cationic starch in China. Other featured products:General AKD Emulsifier 25%, Quat 188 69%,Polymer emulsifier 40%, PolyDADMAC 40%,Wet strenght agent 12.5%/25%, Styrene Acrylic Copolymer, Fixing Agent 50%, Poly Aluminium Chloride, Sodium Gluconate Oxidized Starch,ect. 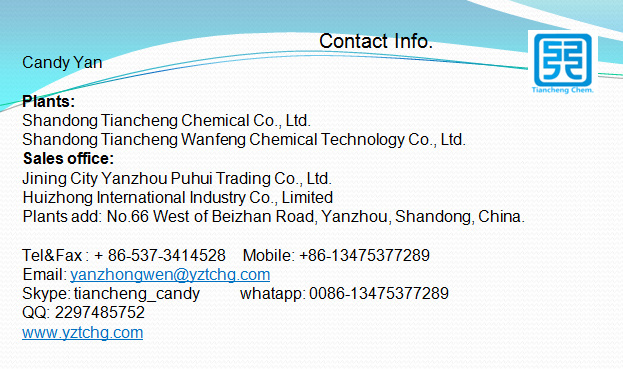 1.Introduction:It is a multiapplication of fine chemical product. Its main ingredient is a trimethyl-(3 - chloro - 2 - hydroxypropyl) ammonium chloride. Its formula is C6H15Cl2NO with molecular weight 188.10. Compared with most domestic products, our product is a high purity stable product with high degree of reaction; lower crystallization point enables its usage in every season. Compared with the solid etherification agent, this product is used without preparation, no water absorption phenomenon; active ingredients won`t deteriorate during transport or storage. Looking for ideal S-QUATA 889 Manufacturer & supplier ? We have a wide selection at great prices to help you get creative. All the S-QUATA 889 69% are quality guaranteed. We are China Origin Factory of Reagens. If you have any question, please feel free to contact us.